Still Our Time...Still Our Prime Storyteller with my podcast, The Not Old Better Show. 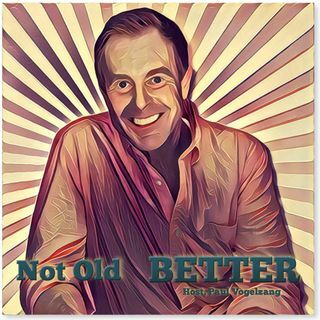 Not Old – Better is a radio show that is broadcast over the Internet using podcast technology discussing the hottest issues and topics that fascinate and inform those 50+ Americans and are of interest and concern to boomers. Not Old – Better viewers and listeners can “tune in” whenever they want, giving them the freedom to enjoy the ... See More show in the gym, in the car, at home or work. Not Old – Better is produced one to two times a week, and each show is roughly 25 – 30 minutes long. The shows are hosted by Paul Vogelzang sharing opinions and experiences with the audience. Show topics discuss issues such as fitness, health, mindfulness, new products, technology, ideas, culture, film, music, literature and many other themes, matters and concerns for the 50+ audience. The hallmark of the show are in-depth guest interviews with leaders in health, fitness, technology, politics and many others. The scope of the show is international so expect to hear many guests from around the world. Check it out, please subscribe & enjoy! Please tells us what you think! Join us and offer your reviews and comments.